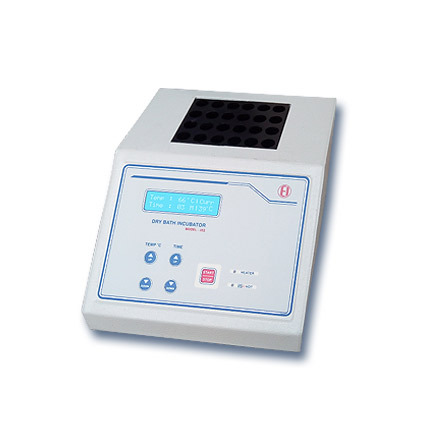 Dry Bath Incubator | products Categories | Electronics India - Manufacturer, Supplier and Exporter of Analytical, Scientific Laboratory and Pharmaceautical Instruments in India. Dry Bath Incubator is a microcontroller based instrument designed to control the heating of thermally conducting block. The block is fabricated to fit in 24 test tubes of 12mm dia. The test tubes contact the walls of the block to provide constant precise temperatures to the test tubes contents. The output of the heater is controlled by means of a precision temperature sensor and highly sensitive automatic electronic temperature controller. It is widely used in samples cultivation, preservation and reaction, DNA amplification, pre- degeneration of electrophoresis and solidification. It is used in the clinical, pharmaceutical, chemical, food safety, environment and quality inspection etc.